What is Pet Legislation and why is it so important? 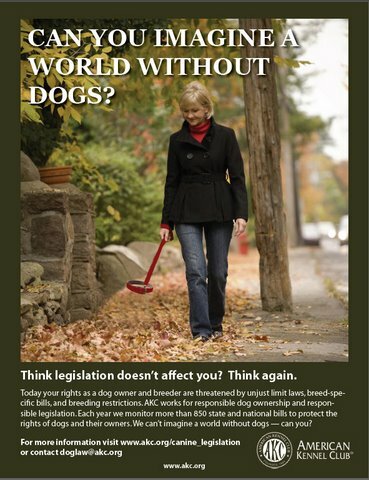 Pet law or animal legislation is a critical area in the fight to defend our rights to own pets. There are many Animal Rights groups such as the Humane Society of the United States (H$U$), People for the Ethical Treatment of Animals (PETA), American Society for the Prevention of Cruelty to Animals (ASPCA) and others, who are systematically working to eliminate all uses of animals and the existence of all domestic animals, whether it be for animal farming, eating animals, life-saving medical research, hunting and even as pets. This is the Animal Rights movement -- they are collecting monies supposedly for animal welfare and using those monies to lobby for laws that make it harder to use animals, breed animals and own them as pets and that will eventually make domestic animals illegal. They are taking away our Constitutional rights to own property. 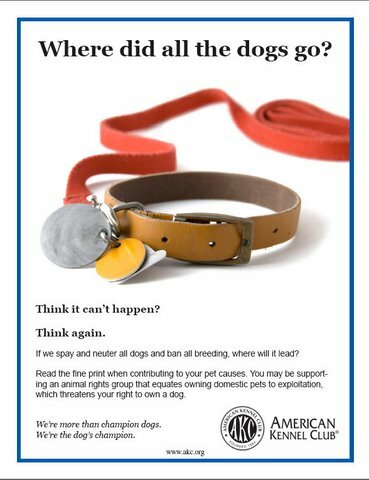 What can you do to protect your rights to own dogs and any other animals? First, NEVER GIVE MONEY TO ANY OF THESE ORGANIZATIONS! Donations to animal rights organizations do NOT fund any shelters, feed any starving animals, rescue any animals or promote good animal husbandry. All those donations go to lobbying and passing laws to eradicate domestic animals. Second, WE are the grassroots and must defend our rights. This means that you must meet your lawmakers, get involved in local politics, become known as the expert in animal welfare to whom lawmakers can turn for legitimate, rational solutions to problems concerning domestic animals and input on responsible animal laws. You have to become active and monitor laws which are being introduced in your community/state/nation. Become connected to the legislative information pipeline and watch for legislative alerts so you can write letters and make calls opposing anti-animal legislation. Find out who the political powers are in your community and state and make the effort to connect with them in a positive manner to present the reality behind the mask of animal rights efforts. Lastly, be aware of what is happening across the country because anti-animal legislation is rampant and if it has not been introduced in your backyard, I can guarantee it will in the near future. BE PROACTIVE!